Being stressed at work leads to burn-out, which is what every company wants to avoid. The Employment Solutions experts in Columbus, frequently recommend to both employees and employers that it’s imperative for employees to decompress while at work in order to maintain a healthy work environment and keep productivity up. Get up and stretch. Lift your arms above your head and bend down to touch your toes. Then, hang one hand behind your head, grab your elbow with the other hand and lightly pull your elbow. 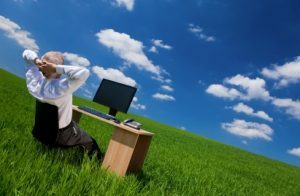 Take a few minutes and breathe in fresh air or open a window clear the air around your workspace. If your office or workplace is fairly private, your employer may allow you to listen to music while you work. Set aside a task that is perplexing or frustrating you. Sometimes, all it takes is a little distance to decide the best way to deal with an obstacle instead of stressing about it. Hunching over your desk scarfing down your lunch will not help you relax for the second half of the day, so head outside to eat your bagged lunch or take a stroll to a local eatery. Call a loved one on your break. A quick chat with a family member or friend during your break can take your mind off of work for a spell. Drink a warm, relaxing beverage. Tea, or even a warm cup of coffee, can lighten your mood and release tension. While dressing for success is important, do not wear uncomfortable clothing or shoes that will make the second half of the day unbearable. Adjust the height of your equipment. Nothing brings on stress worse than an aching back and neck. Raise the height of your computer or workstation to avoid injury. You can simply repeat the word “relax” or remind yourself that this too shall pass if you are feeling overworked. If you are seeking temporary labor employment, Employment Solutions in Greeley has the resources you need to find a job that’s right for you. Contact our expert staff today to schedule an initial consultation and get started on searching our extensive employment database for available positions that match your qualifications. Contact Employment Solutions in Greeley today by calling 970-352-8010!